"I can't help unless you let me." "I might be alone, but at least I'm safe." Martin Painter has been a recluse since his parents died when he was seventeen. Sure, he has money and a sprawling house in an upscale neighborhood, but material things can't patch the holes in his heart. When his sister drags him to a charity auction, the last thing he expects to win is a date with a handsome stranger. He can feel the attraction starting, but it's pointless, isn't it? He's better off alone. He's too awkward for a platonic "date," let alone real love. "Do you ever wonder if you made a wrong turn somewhere?" "We've both got too much to lose, don't we?" Martin isn't sure he's capable of love anymore. Travis isn't sure he's capable of loving a man. But they can't deny it: there's something between them as powerful as gravity, even if it's just a desire to help one another let go of the past. While Travis teaches Martin how to cook, can they teach each other to be happy? 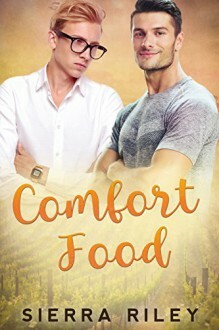 Comfort Food is a steamy, standalone gay romance novel with a HEA and no cliffhangers.